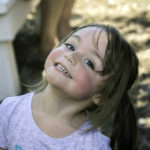 Hay family farms offers a fun-filled day for the whole family. 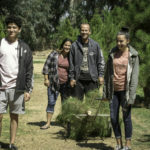 Come cut your own fresh Christmas tree and make memories with your family for a lifetime. It takes approximately 5-7 years for a Christmas tree to grow to the size most folks bring home, with a Christmas tree growing about 1 foot every year. 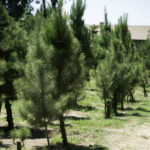 At Hay Family Farms we are pleased to feature Monterey Pine trees, but have several other types of trees available as well. 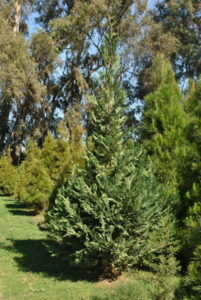 We want to ensure you are 100% satisfied with your tree purchase from Hay Family Farms. If for some reason, you are not, please let us know and we will do everything we can so you will return every year to choose and cut your Christmas Tree. Beauty is in the eye of the beholder and Christmas trees come in all shapes and sizes. Even the “Charlie Brown Tree” found a loving home and added to the Christmas season for the “Peanuts” gang. We have some “Charlie Browns” here and are working to grow beautiful, quality trees for you to enjoy year after year when you come to visit. 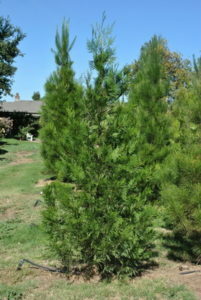 We have over 4000 trees to choose from with heights from 4 feet to over 10 feet. 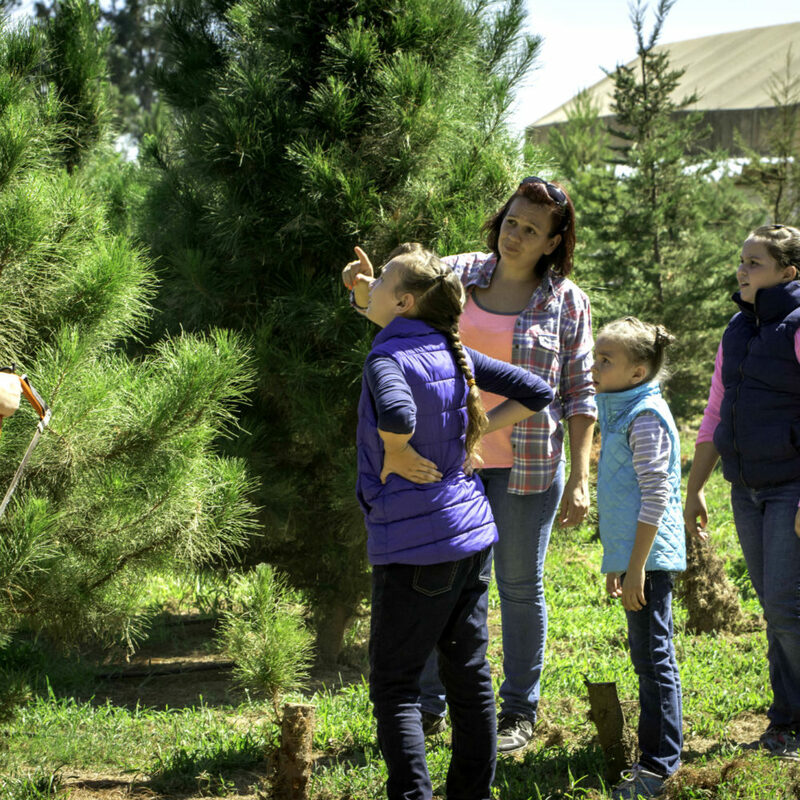 Every tree at Hay Family Farms is shaped by hand each year. Your fresh-cut live Christmas Tree should last through the Christmas season. It will last much longer if you take proper care of it. If you have to travel any distance to home, when you arrive, make a fresh cut in the tree trunk and immediately put it in your tree stand with plenty of water. Ensure your tree has water every day. What should I bring to the farm when I come to choose and cut my tree? We will provide twine for you to use to tie down your tree, but you may want to bring an old towel or blanket to put on top of your vehicle, under the tree. If you need help cutting your tree, we are happy to assist, however for liability purposes, you must secure your own tree for transport home. 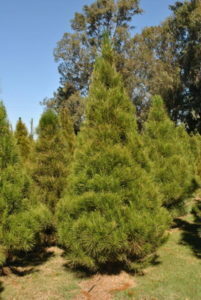 Monterey Pine Trees can grow to 15 feet and are very fragrant and full. The needles are long and well retained. Cedar Trees typically grow up to 8 feet tall and are also fragrant. Their needles grow in a flat fan and this is Laurie’s favorite type of tree. 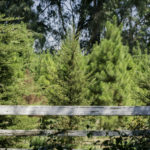 Leyland Cypress Trees typically grow up to 15 feet tall and have a very light fragrance, making them a good choice for folks with allergies. Giant Sequoia Trees also have a light fragrance and can grow up to 9 feet tall and have short needles. 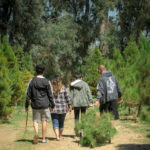 Enjoy a great family outing and start a family tradition this holiday season at our cut your own Christmas Tree Farm. We have over 4000 living trees to choose from with heights of 4′ to over 10′. EVERY Tree of ANY size the SAME LOW PRICE! 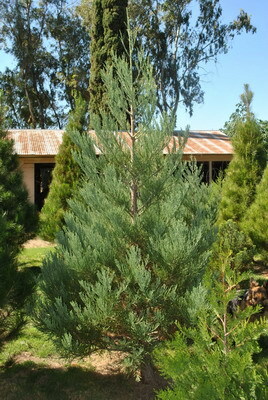 However some trees may be discounted if they are in next Season’s “nursery” where new trees will be planted. Discounts will only be made IF YOU ASK BEFORE CUTTING!